On May 16th and 17th, the Centre for Fashion Studies (IMS), in collaboration with IUAV University of Venice, Italy, organizes a two day symposium, which invites prominent and critical scholars and educators in fashion studies and fashion design; fashion designers; and representatives from the fashion industry to come together to discuss and present research and/or reflections on 1) the field of fashion studies, 2) the conditions of the fashion industry and 3) fashion design education. The aim of the symposium is to provide a platform for discussing the lack of – and the need for – a more critical engagement with fashion in terms of theory, production, education, and practice. Panel discussion moderated by Gabriele Monti and Anja Aronowsky Cronberg. 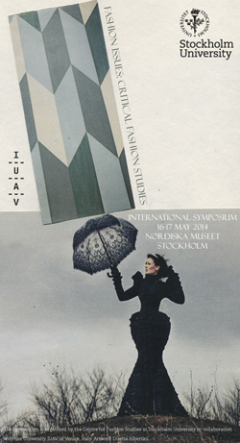 13.30 "The new order of the academical discourse and the transdisciplinariety of Fashion theory"